Founded in 1789 and listed on the National Register of Historic Places, St. Louis #1 is New Orleans’ oldest active City of the Dead. Ornate, crumbling, and entrancing, St. Louis #1 is eerily beautiful even in the daytime. This New Orleans cemetery is the final resting place of the notorious Voodoo Queen Marie Laveau as well as many other colorful New Orleanians. Venture inside the vault lined walls of this historic New Orleans cemetery with your Master Storyteller and visit the New Orleans Musicians’ Tomb and the future tomb of Nicholas Cage. St Louis #1 Cemetery is the oldest active New Orleans cemetery and the most haunted cemetery in Louisiana. In one city block, you’ll find over 700 tombs, and over 100,000 dead. Join us on this fun, daytime cemetery walking tour and enjoy the history behind the unique burial customs that make this possible. Founded in 1789 and listed on the National Register of Historic Places, St. Louis #1 is New Orleans’ oldest active City of the Dead. Ornate, crumbling, and entrancing, St. Louis #1 is eerily beautiful even in the daytime. 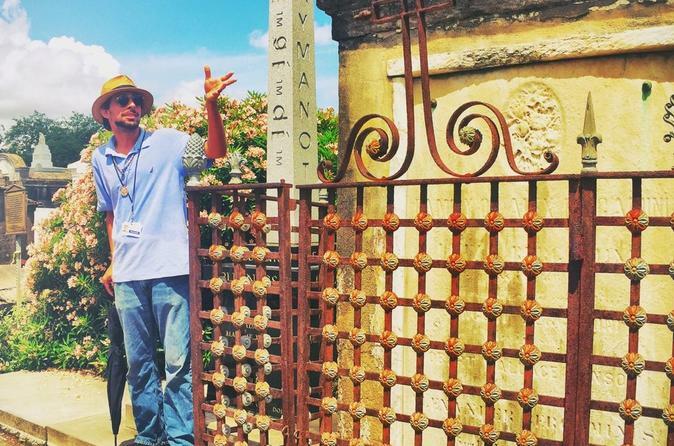 This New Orleans cemetery is the final resting place of the notorious Voodoo Queen Marie Laveau, as well as many other colorful New Orleanians. Venture inside the vault lined walls of this historic New Orleans cemetery with your master storyteller and visit the New Orleans Musicians’ Tomb and the future tomb of Nicholas Cage. New Orleans cemeteries are only available to you as part of an approved tour group. The public is not allowed access to St Louis #1 Cemetery unless accompanied by an Archdiocese approved tour guide.